The purpose of this document is provide the collected and collated best practice recommendations for the adoption of the IMS OneRoster 1.1 standard. This information was produced during the development of the standard and from the feedback of the IMS Members who have the adopted OneRoster. This document is the Final Release, meaning the technical solution is now made available as a public document and as such several IMS Members have aleady successfully completed conformance certification at the time of release of the specification. Public contributions, comments and questions can be posted here: Public OneRoster Forums. 5. REST-based Exchanges Best Practices The set of recommendations for the adoption of the REST/JSON service binding. 6. Realising the Use-cases A descrption of how the OneRoster standard is used to realise a number of use-cases. Appendix A - Key Terms and Definitions A short description of various key terms and definitions used for OneRoster. [AfA PNP, 10] Access For All Digital Personal Needs and Preferences Description for Digital Delivery Information Model 2.0, R.Schwerdtfeger, M.Rothberg and C.Smythe, IMS Global Learning Consortium, Inc., April 2010, https://www.imsglobal.org/accessibility/accpnpv2p0/spec/ISO_ACCPNPinfoModelv2p0.html. [OneRoster, 17a] OneRoster Specification and REST Binding v1.1, P.Nicholls and C.Smythe, IMS Global Learning Consortium, Inc., April 2017, http://www.imsglobal.org/lis/imsonerosterv1p1/imsOneRoster-v1p1.html. OneRoster, 17b] OneRoster 1.1 CSV Tables, P.Nicholls and C.Smythe, IMS Global Learning Consortium, Inc., April 2017, https://www.imsglobal.org/lis/imsOneRosterv1p1/imsOneRosterCSV-v1p1.html. 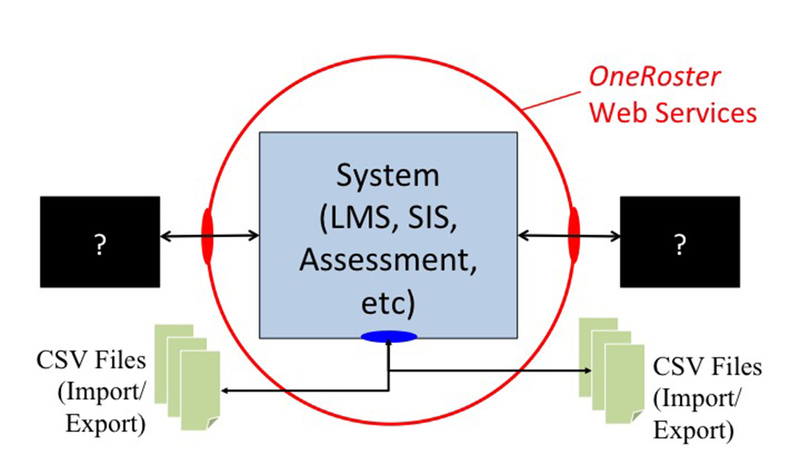 [OneRoster, 17c] OneRoster 1.1 Conformance and Certification, C.Smythe and P.Nicholls, IMS Global Learning Consortium, Inc., April 2017, https://www.imsglobal.org/lis/imsOneRosterv1p1/imsOneRosterConformance-v1p1.html. [RFC1951] DEFLATE Compressed Data Format Specification 1.3 (RFC 1951), P.Deutsch, IETF, May 1996, https://www.ietf.org/rfc/rfc1951.txt. [RFC3629] UTF-8: A Transformation Format of ISO 10646 (RFC 3269), F.Yergeau, IETF, November 2003, https://www.ietf.org/rfc/rfc3269.txt. [RFC4180] Common Format and MIME Type for Comma-Separated Values (CSV) Files (RFC 4180), Y.Shafranovich, IETF, October 2005, https://www.ietf.org/rfc/rfc4180.txt. Gradebooks - the data is broken into results, lineItems (a set of results) and categories (a set of lineItems). Figure 2.1 - OneRoster Interoperability Architecture. REST API - in which the exchange is defined as a set of JSON payloads carried in HTTP calls (this is based upon a RESTful exchange model). The REST API has an extensive set of service endpoints that define how that data can be exchanged in real-time. Most of the endpoints allow the reading of data from a service provider but in the case of Gradebook data it is possible for a service provider to write the data to, or delete the data in, a service consumer. The REST API includes support for: the paging of large payloads, sorting of the data in a payload, selecting data according to a set of filtering rule, and specifying the return of just a subset of the full payload. The primary use-cases for CSV exchange are to enable a subtantial amount of data to be imported into a service provider and for the periodic resynchronisation of the data set in the service provider. The primary use-case for the REST API is to allow consumers/clients to read the data using a read request/response service approach. In the case of Gradebook exchange this has been extended to allow the service provider to push data into a consumer/client using a write/confirm approach. Therefore, a service provider could typically support both CSV and REST exchange methods in which the REST API provides the real-time exchange capability. The ‘sourcedId’ attribute is used to provide the unique identification of the associated object between the communicating end-systems. Ideally, these should be globally unique identifiers (the internal format/structure is an implementation dependent issue and NOT constrained to a form of Universal Unique Identifier, UUID). The identifiers MUST not be used as the internal data store keys i.e. a mapping between the identifier and the key should be maintained by an implementation. Every data object is allocated a unique identifier i.e. its ‘sourcedId’. This identifier must be unique in the context of the two systems that access the object i.e. the identifiers do not have to be globally unique. The end-systems are responsible for maintaining the contextual integrity of these identifiers. The ‘sourcedId’ is not required to have end-system significance except for enabling the associated record to be identified for the processing of the CSV file. It is the inability to find a record for a given ‘sourcedId’ that is used to define a ‘deleted’ record. Therefore, an end-system should have its own unique key for identifying the associated record. This ensures that the record does not have to be deleted from the end-system to provide consistent interoperability deletion. If an object has been deleted then the associated 'sourcedId' MUST NOT be reassigned to another object. Therefore, once a 'sourcedId' has been assigned it is permanently allocated to the associated object and so can be used to recover 'deleted' data. The sourcedId is used as the unique interoperability key. If data is being received from multiple sources e.g. the import and aggregation of many sets of CSV files, then it is possible that the same 'sourcedId' may be used for different objects (each source will have some 'sourcedId' generation/allocation mechanism and so the probability of a clash will depend on the sophistication of those approaches). It is recommended that sytems make use of access control mechanims to minimise accidental data overwriting. For example, in the REST API a HTTP PUT request on an existing object will result in that object being replaced by the new data set. Therefore, a write request should be moderated by a suitable access control mechanism with requests that fail the access control rules returning the HTTP code 403 (forbidden). The string ‘****” will be assigned by IMS as part of the OneRoster Conformance program. The user class has a number of identifier fields. In keeping with IMS specifications, the preferred practice is for the 'sourcedId' field to be used wherever possible, across all systems. That is to say, the SIS should provide a 'sourcedId' for a user to the LMS. The LMS should provide that same 'sourcedId' for that user to any tools that it launches via LTI, rather than supplying some other identifier. This should be true across all orgs and roles. However, it is known that at present this isn’t current practice, so other identifiers have been added to the user class to enable migration to best practice. The 'userId' field is intended as a bridging piece in which any other machine readable 'id' can be stored for a given user. This might be an LTI identifier, or it might be an active directory or LDAP identifier. If LMSs cannot use the 'sourcedIds' for the user when making external calls, then this field can be used instead. In 1.1 support for the assignment of multiple 'userIds' was added in which each identity has an assigned type (there is no predefined vocabulary for this type field and so it is left to local deployments to establish an appropriate vocabulary e.g. LDAP, LTI, etc.). Also included is a field called 'identifier'. This is purely for humans to use when referring to a particular user for whatever reason. It is not a machine-readable field and should not be processed as anything other than a human readable string. These identifiers are purely for humans to use when referring to a particular instance. These fields are not designed to be machine readable, and should not be processed as anything other than a human readable string. NCES Identifiers: In the USA, the National Center for Educational Statistics issues identifiers for schools and districts that are to be used when reporting to the NCES. It is considered best practice to use these identifiers in the appropriate orgs to which they belong. For example, a high school record should include the NCES ID for that high school in the human readable 'identifier' field. Non-US Jurisdictions should agree on a suitable identifier for their region. This field originates from the 'status' field in OR 1.0. In discussing the 'status' field values in OR 1.0 as they are used in 'users.csv', a problem was identified in that the delta mode submissions carried more information than could be expressed in bulk mode. In delta mode, using the 'status' field, one could distinguish a user as needing to be deleted, as being current and active, and as being current but not active. In bulk mode, there are two states, "the row is present in the csv", which most closely corresponds to the delta status of 'active' and "the row was in a previous submission but is now missing from the CSV", which most closely corresponds to the delta status of 'tobedeleted'. So there is an entire value in field 'status', 'inactive', which cannot be modeled in a bulk transmission in OR 1.0. Further discussion revealed that the distinction between 'active' and 'tobedeleted' was a concern of the data exchange protocol, whereas the distinction between 'active' and 'inactive' was useful entity data. Further investigation found that the active vs inactive distinction was only ever intended for users. Given those observations, it was decided to eliminate 'inactive' as a status for all files, and for the Users class, add a new field, 'enabledUser', that expresses the distinction between the OR 1.0 'active' and 'inactive' statuses. In OR 1.1 this fixes the flaw that bulk files cannot express all three states. Now they can, with "row present" and "row missing" being an indication of 'active' vs 'tobedeleted', and, for 'users.csv', the 'enabledUser' field indicating the distinction between OR 1.0's 'active' and 'inactive'. Since the status field was mandatory in OR 1.0 delta submissions, the 'enabledUser' field mandatory in OR 1.1. The ability to accept and understand the 'inactive' status was mandatory in OR 1.0 as well, so it does not add further constraint to OR 1.1 to require that a processor accept the 'enabledUser' field. Once an object has been deleted its 'sourcedId' MUST not be re-assigned to another object i.e. a bulk/delta action on that same 'sourcedId' should cause a recovery of the original object (assuming a hard delete has not occurred) or a failure response (if a hard delete has occurred). The state diagram for the management of records using bulk/delta processing at the service provider is shown in Table 2.1 [OneRoster, 17b]. The file format for each of the data files is a comma separated values format (CSV) as specified in RFC 4180 [RFC4180] with the extra restriction that carriage-returns are not permitted within a field. Fields containing commas and double-quotes must be enclosed in double-quotes. If double-quotes are used to enclose a field, then a double-quote appearing inside the field must be escaped by preceding it with another double-quote. The CSV files must be UTF-8 encoded [RFC3629]. Importing processors must tolerate BOM (Byte Order Mark) prefixes and ignore them. In a UTF-8 encoded file with a BOM, the BOM will appear as the 3-byte sequence ‘EF BB BF’ at the beginning of the file. If present, the CSV header will begin at the 4th byte of the file; if not present, the CSV header will begin at the 1st byte of the file. When the data is exchanged as CSV files, there will be 1-14 CSV files. An exchange MUST include the ‘manifest.csv’ file. The case of when only the ‘manifest.csv’ is supplied is used to denote that no updates occurred. At most, 14 CSV files exchanged i.e. there MUST NOT be more than one of each of the data CSV files. When the set of files are for bulk processing then they must be semantically consistent i.e. every object referenced in a file must also be defined in either the same, or one of the other files in the zip package. The CSV files will be exchanged as a zip file. The encompassed files must be at the root level i.e. they MUST NOT be contained within an enclosing directory. There is NO constraint on the name of the zip file but it must have a file extension of ‘zip’. The compression must conform to RFC 1951 [RFC1951]. Within the zip file there is NO preferred ordering of the CSV files. The CSV files should be exchanged as a zipped file. These files must NOT be encrypted otherwise they will not pass validation: the transport mechanism is responsible for encrypting the data and so protecting the integrity of the CSV files. The transport mechanism is out the scope of the CSV Binding. It is good best practice to support round-tripping between OneRoster versions without losing data. For example, consider when an organization submits a OR 1.1 CSV file to a OneRoster gateway which sends it on to vendors which support v1.1 in v1.1 format but where it needs to send the data to a vendor which support v1.0 only, it sends it in v1.0 form, but rather than throwing away fields which are not part of the v1.0 specification, these are encoded as metadata fields of the same name. For example if the v1.1 'users.csv' includes data for the grade column convert that to a ‘metadata.orv1p1.grade’ column in the equivalent ORv1.0 CSV. While the 1.0 conformant system may not understand the semantics of grade, it may support the display of the metadata fields, including grade to end users who need the grade information, and it may also have use where a system allows search filters include meta-data fields make use of the grade information by filtering on’ metadata.orv1p1.grade’. When converting the v1.0 CSV to v1.1 then ALL the columns with ‘metadata. ***’ should be placed as the final set of columns (the order is NOT significant). 'users.csv' - this file MUST contain references to the associated organization and may contain references to other user objects (whose definition must be contained within the same file). Therefore it must be exchanged with an 'orgs.csv' file. The enumerated vocabularies MUST NOT be extended. Open vocabularies MAY be extended. These extensions should take the form of a URI so that the creator of the term is also supplied. [namepart] the unique header name part allocated by the organization for the data model. Examples are: 'metadata.hmh.homeemail', 'metadata.pearson.namesuffix', etc. metadata.duration No String Description of how long the course runs for (e.g. two weeks, one semester). metadata.boarding No Boolean “true” if school is boarding school. metadata.address1 No String First line of the organization’s free format address e.g. “80 Iron Point Circle”. metadata.address2 No String Second line of the organization’s free format address e.g. “Dept. 2100”. metadata.city No String The city in which the organization operates e.g. Bismarck. metadata.state No String Postal abbreviation for the state/province in which the organization operates, e.g. “ND”. The vocabulary for U.S. addresses: https://ceds.ed.gov/CEDSElementDetails.aspx?TermxTopicId=20837. The vocabulary for Canadian addresses: https://www.canadapost.ca/tools/pg/manual/PGaddress-e.asp?ecid=murl10006450#1442218. metadata.postCode No String The zip/postal code of the organization address, e.g. (for U.S. addresses) “91311” or “91311-5349”, (for Canadian addresses) “K1A 0B1”. metadata.country No String The country in which the organization operates. Use the CEDS Vocabulary at: https://ceds.ed.gov/CEDSElementDetails.aspx?TermxTopicId=20002. metadata.pnpfileurl No String This is the URL for the user's Access for All Personal Needs and Preferences file. This file defines the configuration settings for the accessibility features for any computer systems to be used by the user. The contents of the file identified by this URL are as defined in the associated IMS AfA PNP 2.0 specification [AfA PNP, 10]. In the case of the Gradebook endpoints for data writing (using the HTTP PUT verbs) the payloads must be signed using an extra OAuth parameter. The use of OAuth 2 Bearer Tokens as defined in RFC 6750 for authorization with TLS 1.2 for message encryption. While ALL implementations must support OAuth 1.0a with HMAC-SHA1 over TLS 1.2 for conformance it is STRONGLY RECOMMENDED that HMAC-SHA256 is used (optional conformance for this is also available). For OR 1.2 the ONLY permitted authentication mechanism will be OAuth 2 Bearer Tokens (IMS Global is aligning all authentication mechanisms to be based upon OAuth 2). Care should be taken to avoid overlapping Read/Write requests at a Consumer i.e. a Consumer should ensure that a received Write/Delete request does not conflict with a concurrent and incomplete Read request. The manner in which the conflict is avoided is implementation dependent. The available certifications for a OR 1.1 REST implementation is summarised in Table 5.1. Table 5.1 A comparison of the certifications available for a OneRoster REST compliant product. ALL REST implementations MUST support the OAuth 1.0a/SHA1 message signing. Support for the other authentication mechanisms (OAuth 1.0a/SHA256 and Oauth 2 Bearer Token) is optional and so can ONLY be used if both the provider/consumer have been certified as supporting that mechanism. Assignment-level grade transfer is important for K-12 districts and schools that use SIS technology for state reporting requirements. Typically, the LMS serves as a system of record for assignment data and facilitates the assignment grade transfer on an on-demand or scheduled basis. The SIS provider acts as a grade data consumer and exposes endpoints to accept the assignment grade data from the LMS. OneRoster specification v1.1 gradebook services provides a set of specific RESTful endpoints to facilitate an assignment grade data transfer. OneRoster specification v1.1 gradebook services recommends a set of specific RESTful endpoints to facilitate an assignment grade data transfer. In a typical assignment grade data transfer implementation, the LMS serves as a system of origin for 'lineItem' and 'result' objects. The majority of SIS gradebooks require an end user to segregate 'lineItem' objects by 'lineItem' grading categories such as “homework”, “quizzes” or “essays”. Best practice is for the SIS provider to expose 'lineItem' categories available for the end user in the SIS gradebook via the '\categories' endpoint. The LMS provider will request categories on an on-demand or scheduled basis to allow an end user to maintain SIS LineItem category nomenclature and sourcedIds in the LMS. Commonly, the LMS should provide the end user with a utility to request the transfer of assignment grades to an SIS gradebook on an on-demand or scheduled basis. When a grade transfer is requested, the LMS assembles the LineItem and/or LineItem Result dataset and pushes it to the SIS gradebook. The LMS uses putLineItem and putResult RESTful endpoints to insert assignment and assignment grade objects into the SIS gradebook. SIS to permanently remove Result record that matches provided result sourcedId from SIS gradebook (for hard delete). It should be noted that OneRster oes NOT allow the sourcedId of the result record that was previously deleted to be reused. In the cases when a gradebook data consumer accepts lineItem and result data from multiple gradebook data providers, precautions should be made to avoid accidental overrides of gradebook data lineItem and result records. PUT/DELETE service calls should be executed using UUID or GUID for all records 'sourcedId' values. Gradebook service data consumers may want to uniquely identify requests coming from different data providers to insure gradebook data integrity persists. Depending on the learning technology, a grading category object can have multiple data models. Grading categories are typically used to group the learning objects together according to a specific topic or value. Grading categories also help teachers weigh groups of learning activities and calculate how much each topic contributes toward the course total grade. In the SIS, grading categories could be represented as a grading category library set up by the system administrator, a collection of custom grading categories set up by a teacher, a collection of grading categories available as system defaults, or a combination of all options. Grading categories could be specific to a user, class, course, school, or district. The SIS or LMS could be a system of origin for grading categories; in a typical setup, the SIS provider owns the grading categories, and the LMS provider imports grading categories on regular basis. After the grading categories are imported into the LMS, teachers can start using grading categories in their respective courses. Ideally the grading categories created for a specific class or by a specific user have the class and user sourcedId associated with them, which allows the LMS to properly map grading categories inside the courses or classes and avoid placing any manual data configuration burden on the end user. Adding to the data model - the data model includes a 'metadata' class that MUST be used when new attributes are to be added to a JSON payload (the use of this class is explained in the OneRoster 1.1 specification [OneRoster, 17a]. The addition of attributes into a JSON payload using any other technique is PROHIBITED. It is recommended that organizations that wish to create extensions contact IMS Global (Lisa Mattson, IMS COO). Batch bulk exchange of OneRoster information. Large-scale data aggregation should be realised using CSV Import. The manner in which the zip file data is made available for import is implementation dependent i.e. it is NOT defined as part of the OR specification. The supplier of the CSV files is responsible for assigning/identifying each record with a 'sourcedId'. Therefore, there may be 'sourcedId' clashes when zip files are supplied from more than one supplier/source. Import of a set of CSV files using the bulk mode is used to establish/redefine the data set whereas the delta mode is used to update the data set. The aggregation of data from multiple sources should be carefully managed to ensure that data separation/integrity is managed appropriately. Rostering data can be made available through the REST API or as a set of exported CSV files. Exported CSV files should be used when real-time availability is not required and/or when the size of the data-set is excessive i.e. gigabytes. Once the zip file containing the CSV files has been created the method of exchanging the file is implementation dependent. The REST API makes collections of data sets available depending on the endpoint i.e. all of the 'user' objects are available from one endpoint, a separate endpoint is used for obtaining all of the 'course' objects, etc. Therefore, obtaining a mixed set of objects requires the use of more than one endpoint (the corresponding choreography is implementation dependent). The REST API permits reading of the roster data ONLY i.e. the consumer MUST issue a read request to the provider. A new feature in OR 1.1 is the ability to identify the set of resources that are required for a class and/or course. This identification uses a GUID for the resource i.e. it does not include the actual resource (one way of obtaining the resource is to use an IMS Common Cartridge/Thin Common Cartridge which provides the access to the resource via an identifier). The resource identification can be supplied using either CSV-based or REST API-based exchange. A key new feature in OR 1.1. is extensive support for the exchange of gradebook information. Both CSV-based and REST API-based approaches are available. In the case of the REST API both 'push' and 'pull' endpoints are available. In many implementations there is a choreography using both push and pull approaches (see Section 5.5 for a detailed explanation of how this can be achieved). This is achieved using the REST API with the consumer system reading the data sets from the provider. The consumer must issue a set of read requests on each of the collections that are required for the batch exchange. The REST API defines a pagination mechanism to ensure that the consumer can control the amount of data that it will receive in each response payload. The consumer will issue a sequence of requests until all of the collection has been received. The next collection can then be requested. The order of the reading of the collections is determined by the consumer. This is achieved using CSV export/import. The source system creates the set of CSV files using OR 1.1 CSV export to create the new zip file. This file is now transported to the receiving system (the method of transport is implementation dependent e.g. using secure FTP, etc.). The receiving sytem must now import the CSV file set using OR 1.1 CSV import capability. If errors are detected during the import then a manual recovery mechanism must be used. Bulk-based Exchange This is the exchange of data in which all of the currently stored data is to be replaced by the newly supplied data set. The payload/csv values of the 'status' and 'dateLastModified' fields must be empty. Upon receipt of such records all of the included records are set with the 'status=active' and 'dateLastModified="...date/time of the import..."'. Records that exist in the data store but which are not contained within the new data set must have their status set as 'tobedeleted'. Conformance and Certification Conformance is the process by which IMS determines whether or not an implementation is compliant to a specification. IMS defines the conformance process for each specification that it publishes as part of the specification development process. All implementations that pass the IMS conformance for a specifictaion will be certified as compliant i.e. IMS will award a certification number for that product. Many vendors claim that their products are compliant to a specification but this should be confirmed by checking they are certified i.e. they have a certification number and the product is listed under the IMS Certified Product Directory. CSV-based Exchange The data is contained in a set of CSV files that are exchanged as a zip file. The way in which the data is moved from one system to another is not defined as so may vary from implementation to implementation e.g. using FTP, email, etc. A system may provide data import, data export or both import and export. The phrasing of import/export is used because it is unlikely that the internal storage of the data in a system e.g. LMS, SIS, etc. uses the CSV format. CSV Import The process by which the set of CSV files, a zip file, are loaded into a system. An importing system is expected to validate the set of files syntactically and semantically and must be capable of detecting any errors. The subsequent handling of any files found to contain errors is undefined by the specification. CSV Export The process by which a system creates a set of OneRoster CSV files to be used by some other external system(s). An exporting system must create a semantically consistent set of files determined by the nature of the file e.g. 'bulk' or 'delta'. CSV Reference Test Set This is the set of test CSV files produced by IMS to support conformance testing of systems that claim CSV import functionality support. For OR 1.1, this test set, available through the OneRoster Conformance web-pages, consists of many zip files some of which contain known errors. As part of conformance testing for CSV import, a system must demonstrate that it can correctly process each of the zipped CSV file sets and produce a reprt/log that indicates the result of the import processing. A system MUST detect any errors in the syntax and/or semantics of the data in the CSV files but the subsequent processing of that data is implementation dependent i.e. a system is not required to reject data that has errors (this allows for market differentiation in how systems handle error recovery). Data Aggregator A data aggregator is a system that collects data from one or more systems, processes this information and then makes it available to other systems. OneRoster data aggregators should use OneRoster for the collection and forwarding of the data. Proprietary interfaces could be used, for input or output, but this creates a proprietary gateway approach to the data aggregation. A typical data aggregator would make use of OR CSV-based data importing with the data made available to other systems using the OR REST API. Delta-based Exchange This is the exchange of data in which all of the currently stored data is to be updated by the newly supplied data set. The payload/CSV values of the 'status' and 'dateLastModified' fields must be set. Upon receipt of such records all of the stored records are updated with the new 'status' and 'dateLastModified' values as is data itself. Records that exist in the data store but which are not in the new data set are unchanged. Gradebook 'Pull' Endpoints This is the set of endpoints that enable a Service Consumer to read (pull) the data from the Service Provider. This is the 'readAllCategories', 'readCategory', 'readAllLineItems', 'readLineItem', 'readAllResults', 'readResult' 'getLineItemsForClass', 'getResultsForClass', 'getResultsForLineItemForClass' and 'getResultsForStudentForClass' set of endpoints. Gradebook 'Push' Endpoints This is the set of endpoints that enable a Service Provider to manage (push) the data to/in a Service Consumer. This is the 'putCategory', 'deleteCategory', 'putLineItem', 'deleteLineItem', 'putResult' and 'deleteResult' set of endpoints. The 'push' endpoints operate on a single record ONLY. OneRoster Consumer API (ORCA) This is the reference implementation for the OR Consumer API i.e. the code base for realising the OR consumer funcionality. This can be created by using the OR 1.1 OpenAPI description file and using the Swagger toolkit to create the code library (Swagger supports a wide range of code-bases). OneRoster Gradebook The collection of the exchange features in OR that are responsible for gradebook information. Therefore this is the collection of the 'categories.csv', 'lineItems.csv' and 'results.csv' and/or the endpoints for 'categories', 'results' and 'lineItems'. OneRoster Resources The collection of the exchange features in OR that are responsible for resources information. Therefore this is the collection of the 'classResources.csv', 'courseResources.csv' and 'resources.csv' files and/or the endpoints for 'resources'. OneRoster Rostering The collection of the exchange features in OR that are responsible for achieving rostering. Therefore this is the collection of the 'academicSessions.csv', 'classes.csv', 'courses.csv', 'demographics.csv', 'enrollments.csv', 'orgs.csv' and 'users.csv' files and/or the endpoints for 'academicSessions', 'classes', 'courses', 'demographics', 'enrollments', 'gradingPeriods', 'orgs', schools', 'students', 'teachers', 'terms' and 'users'. OpenAPI/Swagger Definition The OpenAPI specification is a vendor neutral API Description Format based on the Swagger Specification. This specification is developed and supported by the OpenAPI Initiative (OAI): this is an open governance structure under the Linux Foundation. IMS use the OpenAPI format, available in both JSON and YAML forms, to provide a computer-readable form of the OneRoster 1.1 REST API. REST API-based Exchange The exchange is defined as a set of JSON payloads carried in HTTP calls (this is based upon a RESTful exchange model). The REST API has an extensive set of service endpoints that define how that data can be exchanged in real-time. Most of the endpoints allow the reading of data from a service provider but in the case of Gradebook data it is possible for a service provider to write the data to, or delete the data in, a service consumer. The REST API includes support for: the paging of large payloads, sorting of the data in a payload, selecting data according to a set of filtering rule, and specifying the return of just a subset of the full payload. Service Consumer This is an implementation that acts as a OneRoster client i.e. it is capable of issuing the appropriate read requests and receiving the corresponding responses from service providers and/or can respond to the write/delete requests that are issued by a service provider. Service Consumer/Client Conformance Test System These are the test systems that are used to determine if a service consumer is compliant to the OneRoster 1.1 specification. There are two service consumer conformance test systems: (a) one to check that a service consumer correctly issues the requests (pull/read) to a service provider; and (b) one to confirm that the service consumer correctly responds to write/delete (push) requests. The latter is only required for service consumers that support the 'push' Gradebook services. Service Provider A Service Provider is a OneRoster compliant system that makes data available to data consumers. Most of this data is supplied via read requests that are issued to the Service Provider by the data consumer i.e. the consumer 'pulls' the data from the Service Provider. In the case of Gradebook the Service Provider can also 'push' the data into the data consumer using a HTTP PUT request. The data is always supplied to the consumer as a JSON payload. Service Provider Conformance Test System These are the test systems that are used to determine if a service provider is compliant to the OneRoster 1.1 specification. There are two service provider conformance test systems: (a) one to check that a service provider correctly responds to requests (pull/read) received from a service consumer; and (b) one to confirm that the service provider issues correctly formed write/delete (push) requests. The latter is only required for service providers that support the 'push' Gradebook services. SourcedId Each object must have a unique identifier that is used by the communicating OneRoster end-systems to accurately identify the object. In OneRoster this identifier is called the object's 'sourcedId'. This identifier should NOT be used as the primary key for the local storage of the data i.e. the end-systems should maintain a local mapping between the 'sourcedId' and the corresponding database key. Instead this identifier is ONLY used for the interoperability exchange. While it is strongly recommended that these identifiers are globally unique (there is no requirement to be realised as a UUID) the minimum constraint is that they are unique between the set of communicating OneRoster systems. Summary: This is the set of best practice and implementation recommendations when adopting the OneRoster 1.1 specification. These recommendations cover both the CSV and REST-based bindings. Revision Information: The first release of the IMS OneRoster Best Practices and Implementation Guide as a separate document. Purpose: This document is made available to the Public for adoption of the OneRoster specification. Final Release 1.0 3rd June 2015 The first formal release of the Final Release version of this document. The conformance requirements, for both CSV and REST, have been made considerably more demanding and specific.